Includes "Parent & Child Conversation Guide"
When Roxie’s first day at her new school arrives, she has worries. Will she make friends? How long will she be there? Is her teacher nice? Despite her mom’s reassurances, Roxie leaves her sister Mina and nervously sets out for her first few days of class. Join Roxie’s heartwarming adventure as she navigates making new friends, exploring a new classroom, and learning to overcome her fears. This delightful book follows Roxie the fun-loving dachshund in her adventure at her new school. Penned by Roxie’s real-life adoptive mother, psychologist with almost three decades of experience, Jody Dean, this reassuring story will help children make their first steps towards the classroom door. "This book can help children and adults realize, that with open communication and guidance from positive mentors, even a seemingly overwhelming task such as getting through “the first day” can be pleasant! As a professional and mother of two, I know that it is sometimes parents who struggle more with containing their emotions on “the first day” than their own children. I highly recommend this book to any age group as it helps process a very common emotion in a tender and therapeutic manner." 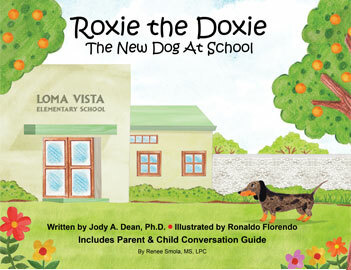 Roxie the Doxie comes with a guide for parents written by a clinician in non clinical terms, to help parents or any caregivers successfully guide a child through their first days at school, or their first days at a new school, or a school with a new peer group. The guide offers questions to ask a child, things to expect, and what to do if a caregiver feels things are not progressing in the way they had hoped. e’s first day at her new school arrives, she has worries. Will she make friends? How long will she be there? Is her teacher nice? Despite her mom’s reassurances, Roxie leaves her sister Mina and nervously sets out for her first few days of class. Join Roxie’s heartwarming adventure as she navigates making new friends, exploring a new classroom, and learning to overcome her fears. Children can immediately contact Roxie at Meet the Real Roxie. 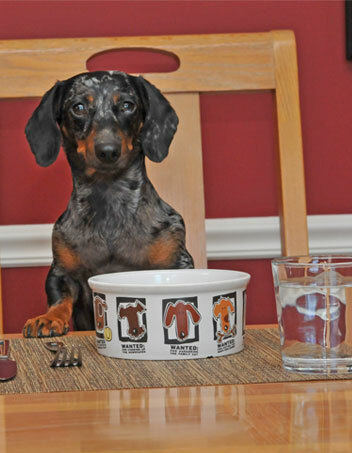 Follow Roxie, a dachshund dog, as she begins her journey as the new student at school. Filled with both excitement and trepidation, she meets her teacher, learns new things, makes some new friends and even has to compete in a “challenge”, with the hopes of winning a prize. 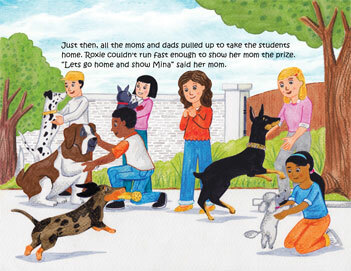 Based on a real dog’s story, the book is designed to help children through the complicated, often uncertain process of separating from their parents on the first day or school, or starting at a new school as the new child in class. It shows children that it is perfectly normal to be afraid or anxious, and to ask questions, and most importantly that everything will work out all right. Roxie’s transition allows children to understand and express their feelings in an easy, fun way without feeling threatened. The book also includes a Parent Conversation Guide written by a therapist who specializes in child psychology. The easy to use guide is written to help adult caregivers explore with a child the first day at school prior to that critical first day, and answer questions they may have. 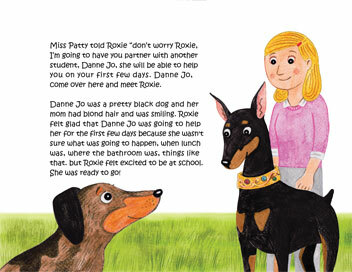 There is also a photo-section in the book with information about the real Roxie, including her e-mail contact so that children can talk directly with Roxie and ask her questions about adoption and other challenges they may not want to ask their caregivers – a safe way for children to express their feelings without feeling threatened. Individual answers to the children’s questions are crafted by Roxie’s real adoptive mother, Jody A. Dean, Ph.D., a psychologist with 28 years experience specializing in children and adolescents. Children can email Roxie at Meet the Real Roxie.